The new pairing of Nicole Melichar and Kveta Peschke has successfully qualified for the 2018 WTA Finals after a year of solid results. Pairing up only at the start of this year, Nicole Melichar and Kveta Peschke, of which both are excellent doubles specialists, has strung together a series of outstanding performance for them to stamp their authority across the field. They are ranked sixth on the Porsche Race to Singapore leaderboard and has successfully qualified for the 2018 WTA Finals in their first attempt. 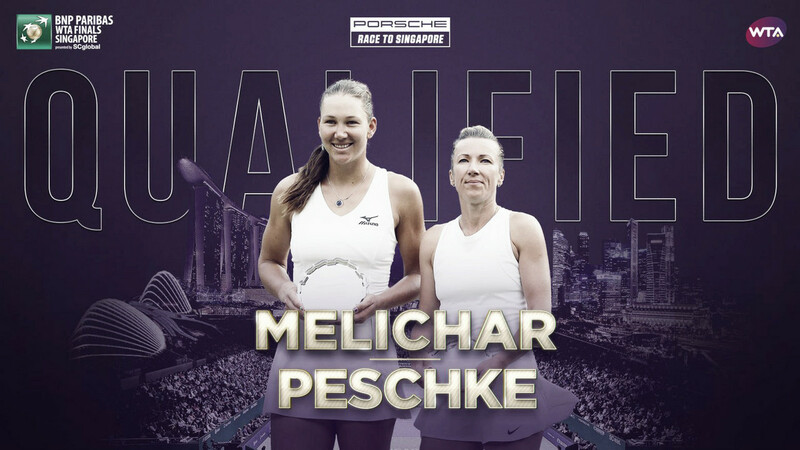 After a relatively unsuccessful start to their partnership, Melichar and Peschke finally tasted some success after reaching the final at the Porsche Tennis Grand Prix. They excelled on clay as the pair continued their run of good form in Prague; grabbing their first title together as a pair. Another semifinal appearance in Nuremberg followed before the French Open, where they narrowly lost to top seeds Babos/Mladenovic there. Their grass-court season was highlighted by a run to the semifinals in Birmingham, but more importantly, a breakthrough run to the final of Wimbledon. As the 12th seeds, they stormed past three consecutive seeded opponents but fell to Krejcikova/Siniakova, who is currently the top-ranked pair in the world, in the final. Melichar and Peschke then reached the semifinals in Montreal, defeating Babos/Mladenovic along the way although they failed to maintain their high level of play through the remainder of the US Open Series. In Asia, they made consecutive quarterfinals in Wuhan and Beijing before claiming the title in Tianjin without facing any seeded opponents. Reaching four finals this year, Melichar and Peschke will make their first appearance at the prestigious tournament as a pair. Individually, this will be the American’s debut in the year-ending championships while Peschke, as a former world number one, has qualified on seven previous occasions and reaching the final thrice. They may face a tricky opener to their Singapore campaign as they will certainly face one of the top-four pairs in the world there as the sixth seed.